You bringing the boat down to Tampa On sunday, i will rents some jet skis. Lunch at one of those famous joints on the bay. This is going to be very Cool, what the odds of getting Russ down. 12.5 a day plus Sun that 8.33 a day. Are you nuts???????????? I hope thats a mistake????? I was able to register. Thanks. We definetly need to get Russ down here and we need to get him on a Waverunner out in the Gulf. Is this associated with NOLA? I heard that since the names are so similar now that the organizers of NOLA have changed the name of their event to "NOLA Rontable". Alas, I only report what I hear. The Boat is at my Marina i have no trailer, i fiqured we can go out on sunday!! You own a Marina now Too? Forida is really nice in August. Barney is anti social. I thought you knew that Thad. Yea i won it in a poker game!! Actually I do own my slip, were all owners at this marina. I really, really need to learn how to play cards. LOL... Nick do they have any waverunner rentals near YOUR MARINA? No Rentals, For me to get the boat over to tampa i would have to go all the way down and under the skyway bridge and into tampa bay? I would like to welcome our newest sponsor Hydro Tek! nice job in landing that one Kory... looks like you've organized a great event!! You need to do a little explainin, Hydrotek the factory? or a local Hydrotek? What ever it is Great job Kory, I will try to get a another Hotwater Skid. 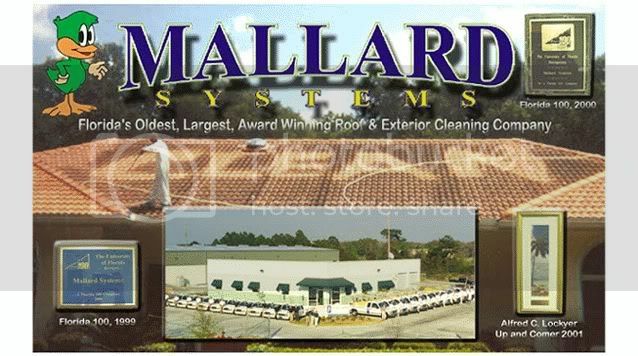 Mallard once had 44 Roof Cleaning Trucks. I am signed up so I will be there.